192-LEDs for optimum illumination and diffuser, ensuring your pictures' perfect settings.Ultra thin and lightweight, with mighty power and balanced luminance; 3200K-6000K color temperature, 0-100% dimmable.90 degree adjustment holder for providing different angle's light need.4 LEDs display the present power level. Hot shoe with 1/4" screw hole suitable for most DSLR and tripod.Color: BlackMaterial: ABSLED quantity: 192Color temperature: 3200K/6000KLumen: 1350 LuxOutput power: 12WDimmer: 0%-100%Beam angle: 120 degreeVoltage: 7.5VLithium battery type: NP-F series (such as NP-F750/NP-F970)(Battery is Not included)Item size: 150*100*15mm/5.9x3.93x0.59inchPackage Includes:1 x 192 LED Video Light1 x Hot ShoeNote: Light shooting and different displays may cause the. The LED Video Light LituFoto F12 is designed for the daily convenient shooting. 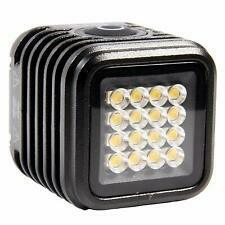 1x LituFoto F12 LED Video Light. Battery life: 100% 5600K power continue output for about 1. 2 hours, 5% 5600K power continue output for about 8 hours. W/ CAMCORDER W/ DSLR W/ POINT-AND-SHOOT. Record crystal-clear sound with theVidpro Mini Condenser Microphone. Vidpro VB-3 Triple Shoe Mounting Y-Bracket. Requires 2 AA batteries (not included). In addition to fitting on hot/cold accessory shoes, the Y-Bracket also features a 1/4"-20 and 3/8" thread for attaching the bracket to a tripod, rig or other bracket featuring a threaded mount. The USB port is even waterproof, so it survives depths whether you have the cover on or off. USB Charging Cable. White Diffuser. We will try our best to make it as easy as possible. 80° beam spread. Mount Type: 2 x 1/4"-20 mounting holes, Rear Magnet. Beam Angle: 80°. Lamp Type: 8 LEDs. 3-Prong Mounting Adapter. Color Temperature: 5700K. White Diffuser. Item Weight: 3.17 oz (90 g). Genuine 6th Generation Ghost Light™ ADV Series IR Light. 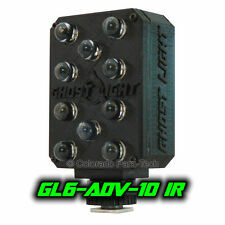 Ghost Light™ GL6-ADV10 IR Light Black . GHOST LIGHTS™, currently in the 6th Generation, are state of the art Infrared (IR) and Multi-Spectrum LED lights. 2 YEAR WARRANTY - As with all NanGuang products, this light has a two year UK manufacturer's warranty. This compact, light unit is battery powered (batteries not included), and can be locked together with other units of the CNLUX1600C to create a multiple light bank. The output is flicker-free at any of the three continuous output settings. Beam Angle 70°. USB Charging Cable. Color Temperature 5600K. White Diffuser. Flash & Lighting. Color Accuracy Standard CRI 90 TLCI 92. Model: L116T LED light. 1 x L116T LED light. Max Brightness illuminance: 987LM/810lux/0.5M. It can be mounted on DSLR DV camcorder and tripod. You can adjust the brightness and color temperature steplessly. It's a flexible and convenient light for use in standard operations, vlogging, and selfie shots. Being that it's so small, you can simply pull it out of your pocket and hold it with your hand to light up a shot or a place. Vibesta Verata160 LED Kopflicht . Beide Filter werden mit Magneten einfach an der Leuchte befestigt. Die Verata160 hat 4 klappbare Flügeltore, die störendes Seitenlicht verhindern können. Die Videoleuchte kann mit Sony NP-F Akkus betrieben werden. Despite its size, the Lumie Art can fit itself into many shooting situations for both stills and video. Filter Carrying Case. Snap-Fit Filter Mount. The whole kit takes 5 minutes to assemble. Composed of 480 high quality SMD LED lights scientifically arranged in a diamond like pattern to reduce shadows and create a soft ambience. The color temperature is step-less with a range of 3200k to 5600k. FARETTO ILLUMINATORE 160 LED. Pulsante prova batteria con 4 LED. a richiesta. L'illuminatore e' compatibile con batterie Sony NP-F550 / 570 / 770 /960 /970. E' possibile collegare fino a 6 illuminatori (3 x2) per creare un piu' grande luminoso pannello. Intova Underwater Action Video Light with Bracket Mount. Take amazing underwater shots with this economical video light. Aquick release snap at the end of the strap makes it simple to remove and reattach, and thebright red exterior material makes this strap easy to spot when floating in the water. 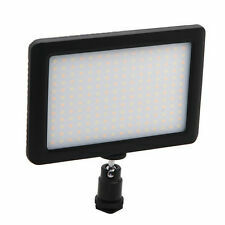 Aputure AL-MX LED Light x 1. CRI>95, TLCI>95. Booster Brightness Button. Constant Light Output. The Viola features a dimmable output that can be adjusted from either 3000 to 10,000K or 0 to 360° RGB. The unit incorporates two endlessly rotating knobs. With the app, you can adjust the output of the light to match a specific point of an image or video. Furman 4 x 2 Audio Mixer Model MM-8A. You can see it powered up in the Photo. For Sale is one Furman 4 x 2 Audio Mixer Model MM-8A. You can see it Powered up in the picture. I tried it and it works Nice. TheVidpro LED-330X Varicolor Studio Video Light features the latestSMD technology (surface mounted device) LEDs. Plus, since LEDs give off very little heat, your subjects will be more comfortable during long shooting sessions. VIVITAR PRO SLAVE FLASH. Wireless Slave Functionality. Array of 36 powerful LEDs provide bright, even lighting to range of 35 feet. • Unique interlocking design allows stacking to create a multi-unit array. Luminance Angle: 55°. Light Source: 300 LED beads. Adopted the professional LED driving chip,the light is stable and the efficiency achieves 93%. - 1 x YN300II Pro LED Video Light. Color Temperature: 3200K-5500K. LEDGO LG-R320C. LED - Bi-Color - Ringleuchte. Abnehmbarer, biegbarer Handgriff mit 1/4" Schraube oben und Stativadapter unten, passend für alle normalen Leuchtenstative. Material der Leuchte Kunststoff, Diffuserkappe vor den LEDs: Kunststoff. For Sony Canon Nikon Panasonic DSLR. It consists of 96 pieces highlighted LEDs, with mighty power and balanced luminance. with softbox background,hot shoe adapter,DC Adapter. Features with color temperature knob, can adjust the color temperature from 3200K to 5600K. LIFE of PHOTO PRO rundes LED Softlight SET C-300R Studioleuchte. Mit dem ModellC-300R bietet LIFE of PHOTO eine neuedimmbare LED-Leuchte aus der PRO-Serie an. Durch die spezielle Diffusor-Beschichtung der runden Leuchtfläche (Ø ca. 26 cm) wird ein besonders weiches, blendfreies Licht erzeugt. 9 SMD light beads, Creating High illuminance. ＞1.75h（maximum brightness）. Ultra Thin with Only 140g Weight. Color Temperature. Battery Type. Number of LEDs. SL-100 700 Lumens Video Light Waterproof Strobe Underwater 40M For Camera Nice! 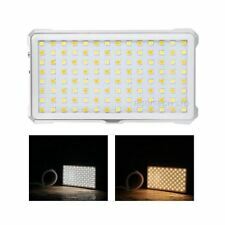 Ø The LED flash is latest R&D with simple decent and portable design, low-power, and high-brightness. It is specially customized for shooting and photograph, good for various occasions. Do not fall or crash. This Frezzi light accessory was tailor-made for the Frezzi Micro Fill compact light that is very popular with news, sports and event videographers. LED Readout. Our new generation of LED lights are edge lit so they produce a soft even output. Compact design makes perfect for traveling photographers on the go. With a very high CRI of >95, the color reproduction is excellent with these Bi-color lights. These lights can run on battery power (though expensive), but can also be run on mains. The specs, as you'll find are required on the back of your light, are 8V and 5A. This will power your light continually without the need for batteries. Optical Sensor Slave Flash. 1/4"-20 Female Threads. Battery Duration at 100% Brightness: 20 minutes. Battery Duration at 90% Brightness: 60 minutes. Battery Duration at 50% Brightness: 120 minutes. Mount Type: 1/4"-20 female. Neo includes three groundbreaking features that sets it apart from the field. Finally, an arsenal of Cinematographic Special FX (CineSFX), provides customisable creative visual lighting effects, on set or location (Strobe, Lightning, Fire, Cycle, Throb). Vibesta Verata 160B LED Kopflicht . Die Verata 160B hat 4 klappbare Flügeltore, die störendes Seitenlicht verhindern können. Die Videoleuchte kann mit Sony NP-F Akkus betrieben werden. Der Filter wird mit Magneten einfach an der Leuchte befestigt. The light is suitable for use as either a video light or still photo strobe. The flash features variable duration from 1/8000 of a second to freeze motion, to one second for more exposure. Color Temperature: 5400K (3200k w/filter). Adopts concentration LED lights, irradiation distance can reach more than 5m, suitable for. Designed with Standard hot shoe plug, so can be installed on the DV or DSLR, and DC with. Amaran AL-H198 LED Video Light features CRI95 and compact 198 LED bulbs in a portable panel to support powerful brightness. CRI 95 , almost perfect color accuracy. Color Tempature: 5500K. CRI:≥ 95 Ra. The NanGuang Luxpad 22 photo / video lighting utilises high efficiency LEDs and emits a soft, gentle, diffused light ideal for all-round general photography and video with adjustable colour temperature 3200-5600K. Product model: HR-672 Power Adapter. Aputure AL-528W Features. Aputure AL-528W Specifications. Flood 75 deg, Beam Angle. Beam Angle. Digital brightness display. Brightness wheel. Battery power indicator. Universal lamp bracket. IKAN OYB120 Bi-Color On-Camera LED Light - works great! Used for one filming project. Light panel as new condition. I have two available. Extra's include Soft-box with egg create. Each cost £365 Grab a bargain. TORCHE PROJECTEUR VIDEO ..CULLMANN CL-10S ..8215 NP6- Sony.. collection ..NEUF..
TORCHE PROJECTEUR VIDEO. CULLMANN CL-10S. NP6-System 6 volts Sony. Point Relais MONDIAL RELAY. A must-have accessory for photographers and videos out on location! The Anova Rain Cover from Portabrace is made from waterproof Taslan material. Custom fit to the Rotolight Anova, the Rain Cover works with or without barn doors.